New York, Sep 21 (IANS) Hinduism is a “wonderful” religion suited for the modern era of uncertainty and questioning because it values incertitude, according to Congress MP and author Shashi Tharoor, who also excoriated the politicisation of the faith. “Hinduism rests on the fact that there is a heck of a lot we don’t know about,” Tharoor said on Thursday during an interactive session at JLF@NewYork, the edition of the Jaipur Literature Festival. What makes it fit for today’s world, he said “the first is the wonderful fact that in an era of uncertainty, incertitude, you have uniquely a religion that privileges incertitude”. About creation, the Rig Veda actually says “where the universe comes from, who made all of this heaven and earth, may be He in the heaven knows, may be even He does not know”, he noted. “A religion that is prepared to question the omniscience of the Creator is to my mind a wonderful faith for a modern or post-modern sensibility. “On top of that, you have got extraordinary eclecticism” and since no one knows what God looks like one is free to imagine God as one likes in Hinduism, he said. The Congress Party MP, who is the author of “Why I am a Hindu”, took issue with those who condemn the religion as built on misogyny and discrimination. About the Laws of Manu, he said, “there is very little evidence as to whether they were observed” and there were many texts that existed. Of these texts, “I don’t think every Hindu took the advice of the Kama Sutra, either”, he joked. “For every misogynistic or casteist pronouncements (in Hindu texts) I can give you other equally sanctified texts that preach against casteism,” he said. He made a distinction between religion and social practices that are not based on faith. Tharoor’s expansive and deep explanation flies in the face of campaigns in the US against Hinduism with claims about caste discrimination and misogyny, including attempts to disrupt the World Hindu Congress earlier this month in Chicago. 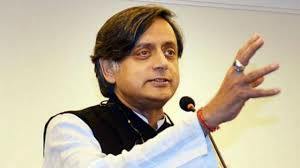 Tharoor held out hope for the spirit of tolerance and acceptance to triumph in India. The spasms of bigotry were a passing phase in India because tolerance and acceptance of the other was “built into the bones” of the Indian people, he said. “That kind of bigotry that we have seen whipped up in the recent years is essentially a political exercise and to my mind not in any way reflective of the spirit of most of the Indian people,” he said. “You can’t really change their fundamental nature,” he added. The “resurgent Hindu nationalism is actually based on a dismaying inferiority complex” of those who feel their “religion has been conquered, subjugated; they feel a humiliation, an ancestral humiliation”, he said. “Whereas the Hinduism that I have seen, read, grown up with, practiced and being taught is a much more self-confident Hinduism,” he said, conceding that the approaches may be a sign of a north-south divide.